(21st Hapilos Digital) - Like him or not, there is no denying that superstar Vybz Kartel is undoubtedly one of the biggest recognizable name in dancehall. Steeped by controversy, made his mark topping billboard charts, recognized by Time magazine or his music being used on TV shows internationally, Vybz Kartel is a musical force to be reckoned. Missed by his fans, they are only comforted by the fact that music is still being released, and this latter is sure to delight them. The EP consists of 6 tracks who have reached over 10 million views combined on official and viral videos on youtube. 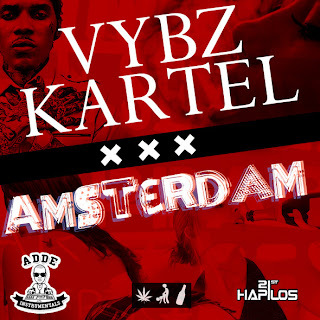 Bubble Hard, Summertime, Open Up, Bike Backand Dedication are now available on on this latest "Amsterdam" EP by Adde Instrumentals/RR345 Muzik and distributed by 21st Hapilos Digital. Adde Instrumentals is responsible for building such hit riddims as "Summer Time, BBQ, Summer Wave, Happy Daze, Ice Cream" and many more. The young producer based in Sweden hit the dancehall charts with his first hit "Bike Back" featuring Vybz Kartel.